The arrival date of your order can vary depending when you submitted your and which shipping option you chose. 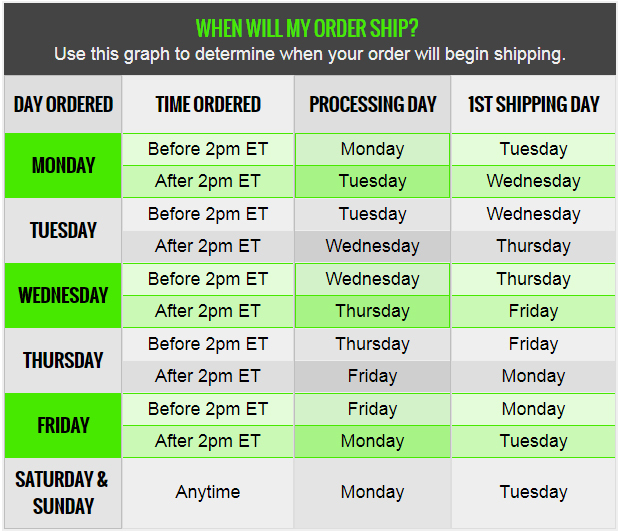 Also, please take into consideration the order processing time (typically 1 day), which is not counted as a shipping day. Non-business days, such as Saturday, Sunday and U.S. Federal holidays are also not counted as shipping days. See the graph below for the expected ship day for each day of the week. However, once your order has shipped you should be emailed a tracking code link that you can use to see where your order is, while in transit to the delivery location. In addition to that, if your order is shipped with USPS you can have shipping update notifications sent to you via text or email. Just click on your tracking code link, then underneath the expected delivery date, click on the Text & Email Updates link to select how you would like to be notified, and fill in either your email or phone number. Learn more about USPS notifications. If you did not receive or have misplaced your tracking code email, you can log in to your account to view your tracking code on the order details page that is visible from the View Order Status page. If you have not activated your account yet, click here to set a password and activate it now. I have a problem and/or question on my order. How do I contact you? The best way to contact us about regarding your order is to log in to your account and use the built-in messaging system. If you have not activated your account yet, click here to set a password and activate it now. Once logged in, navigate to the Messages page. Under Send a Message, select the order in question from the Order dropdown, fill in the Subject and Message fields and click submit. Once received, our customer service staff will look into your inquiry and get back to you with further information on the subject. For service and product related questions, including product availability and product requests, click here.